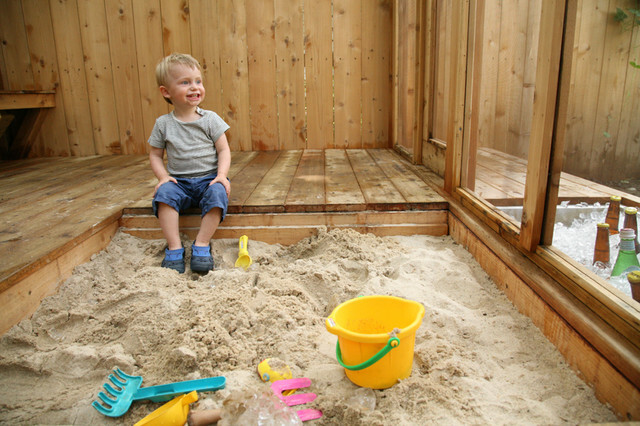 While any sort of platform in a tree or a cardboard box clubhouse will make a kid happy, it is a great bonus if this permanent structure is visually appealing for adults. Even better if it's a place we like to escape to from time to time. 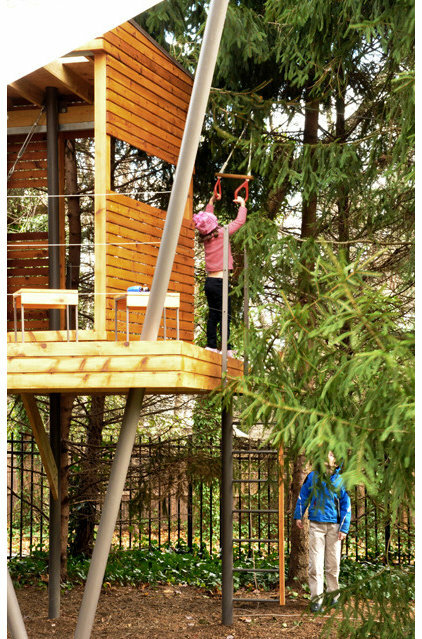 With the latest in kiddo fort designs, children get the benefits of climbing walls, fire poles and suspended bridges, while the grown-ups get to gaze out on little structures that look like an architect's model or a Mondrian cube. Who knows, after the kids grow up, maybe the adults will take these over as offices, potting sheds, studios or money-making rentals. Here's a peek at 12 favorites. 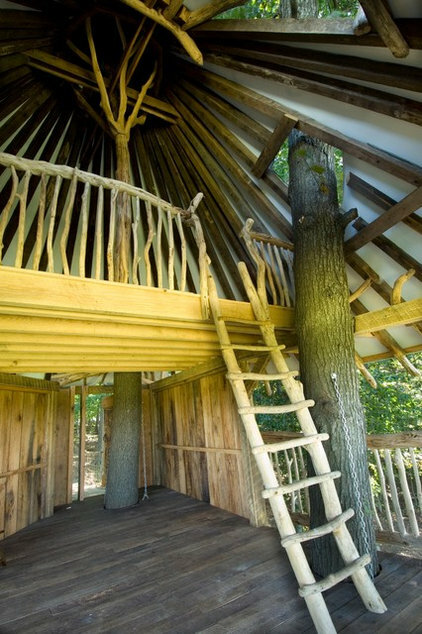 Sometimes I think designing and building tree houses brings architects back to their woodshop days in architecture school. This fabulous fort looks like an architectural model to me, with thoughtful overhangs to mitigate direct sunlight and an assemblage of reclaimed wood. It also looks like a lot of fun with its ropes and ladders, which is the point after all. This floral fort wins the Best Use of an Old Tree Stump award. 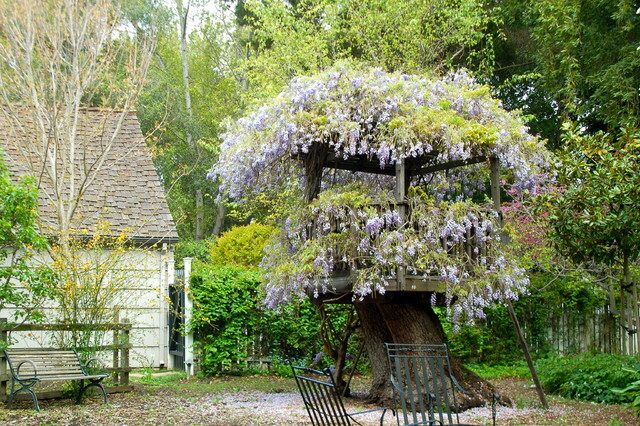 While I wouldn't recommend this wisteria-draped getaway for anyone allergic to any kind of stings, it could be a great place in which to perform scenes from Romeo and Juliet or Cyrano de Bergerac. 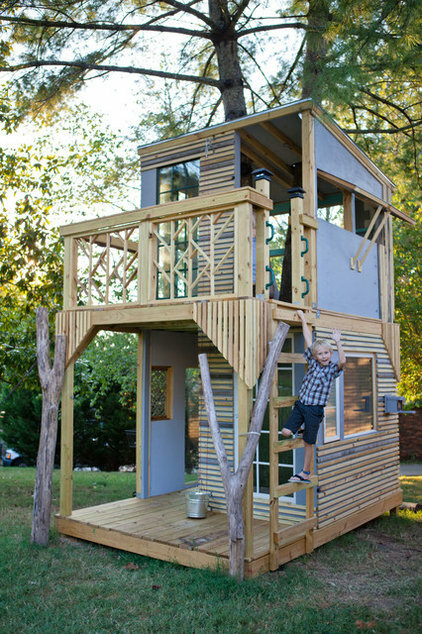 This slatted elevated fort is fun to climb up to, hang out in and descend from, while its contemporary architecture is far from the eyesore most tree houses are for Mom and Dad. 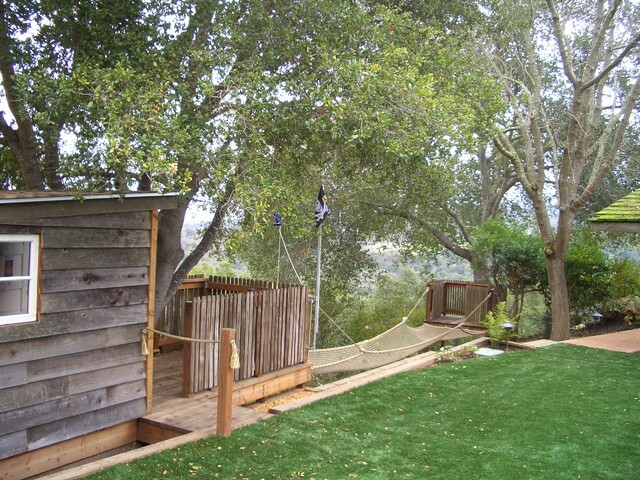 This fort makes the most of the yard's change in elevation. From the front one sees the tempting fun of the nets and fire pole, while around back there's a pole, a slide and a swing set. 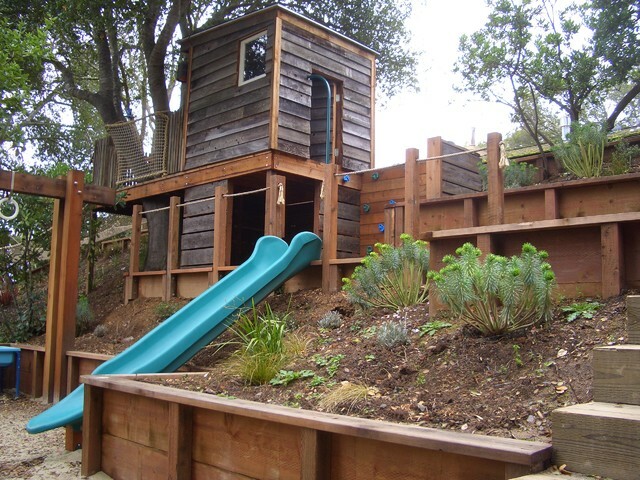 The ordered yet ramshackle style of this two-story fort gives it architectural interest while still attracting children. 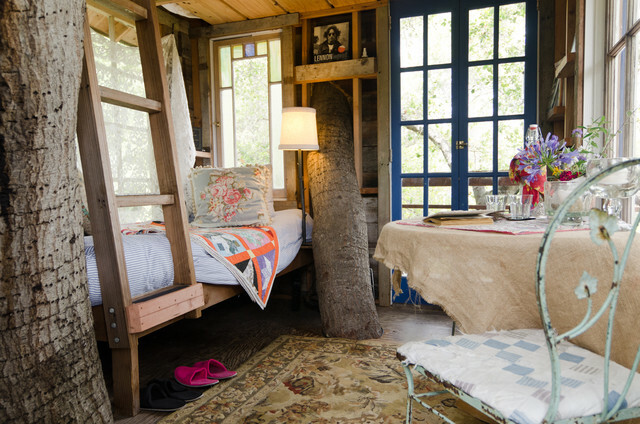 Its mix of materials is very Austin, Texas, keepin' it hip and weird. 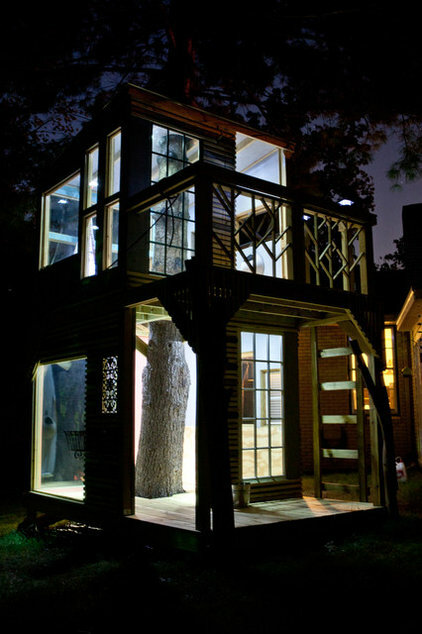 When it's lit up at night, you can see how the house was built right around a tree. This is another of those easy-on-the-eyes structures. 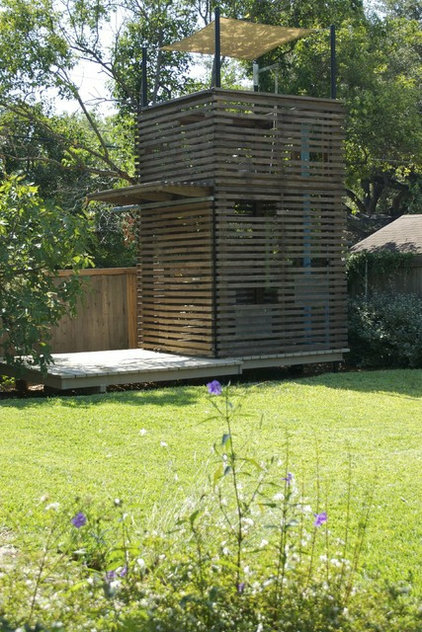 The tall, Jenga-like tower has peekaboo slats as well as its own deck and roof deck (complete with sail shade). 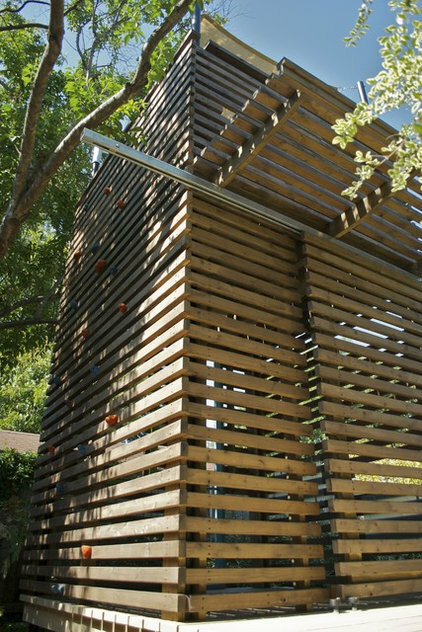 In addition there is a climbing wall option up the side, as well as a balcony. 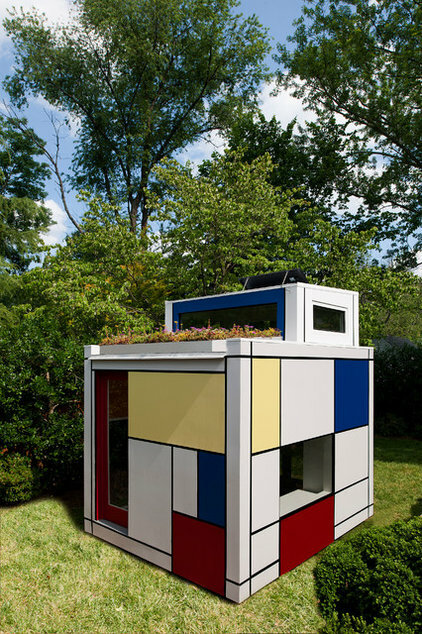 This cool little cube is certainly easy on a modern art fan's eyes and can even serve as a sculpture in the backyard. 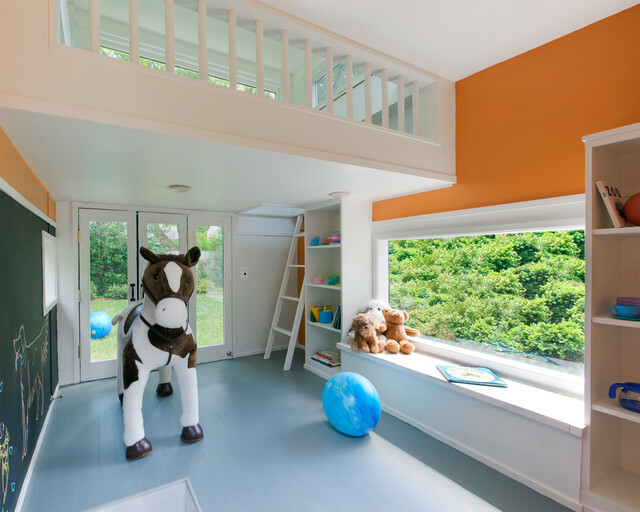 It has a great playspace inside that includes a chalkboard wall, bookshelves, a window seat and even a peekaboo clear panel in the floor that can sit atop a koi pond. 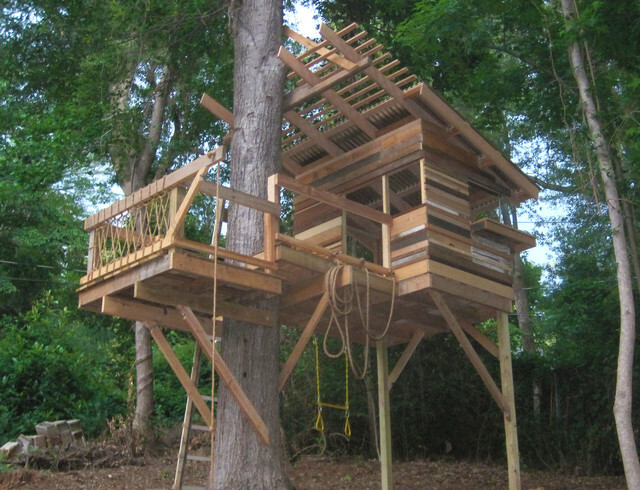 A suspended bridge is now the latest craze in backyard forts and tree houses. Maybe it's because of the rising popularity of Costa Rica as a vacation destination? I am not sure what brought this on, but it is in all the cool backyards right now. Another loft inside provides a fort within a fort. 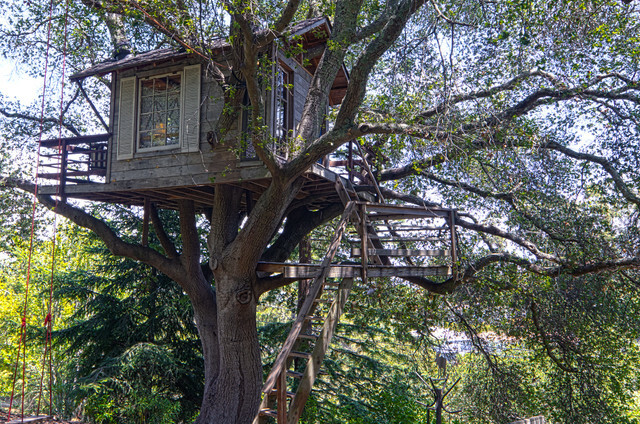 The entire family pitched in to build this amazing tree house overlooking the San Francisco Bay. 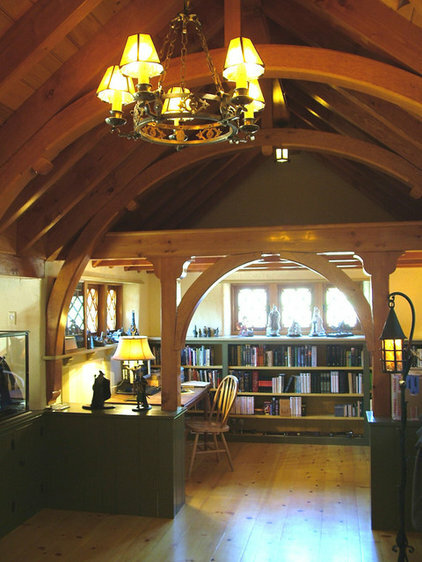 They used as many reclaimed and vintage items as possible, including stained glass windows. 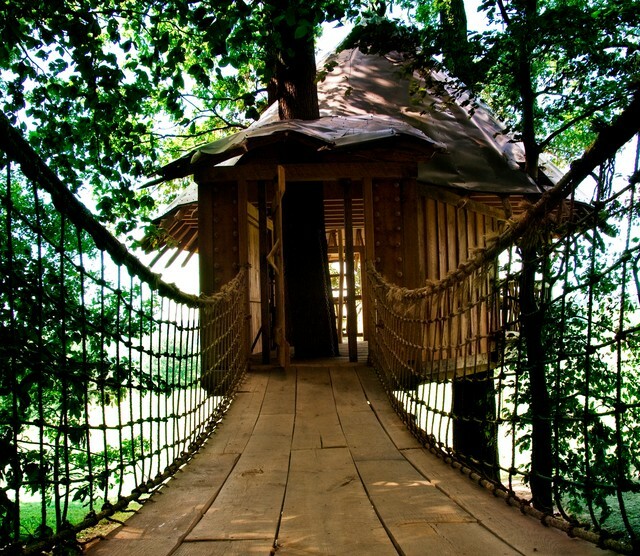 Now that the kids are all grown up, the family rents the appealing and cozy tree house to visitors (you can stay here too). 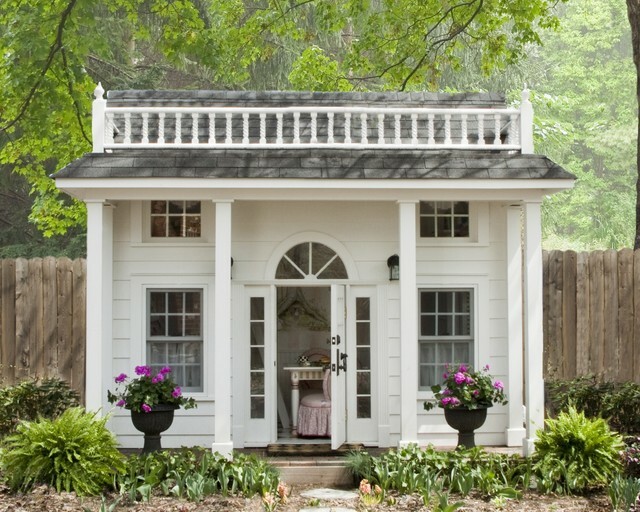 These homeowners built a playhouse that matches their own house, right down to the planter urns, for their toddler, Birdie. 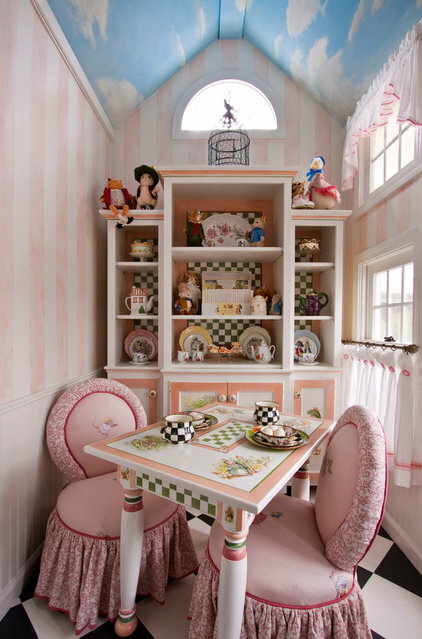 The family are big fans of Beatrix Potter and MacKenzie-Childs. The interiors are inspired by both and also are built to stand up to adults who are visiting for tea parties and story hour. 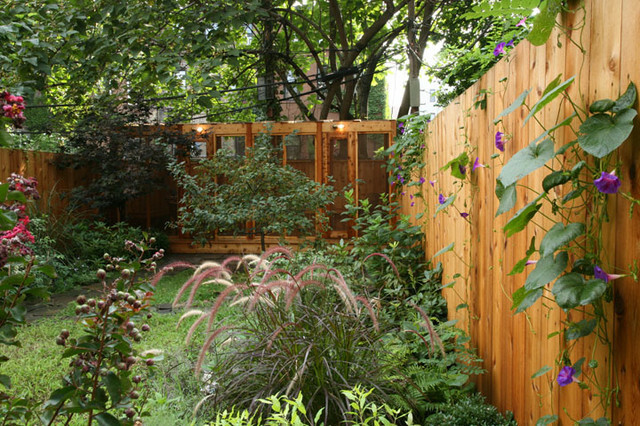 This big backyard in Brooklyn, New York, was crying out for a bug-free space for all ages to enjoy. 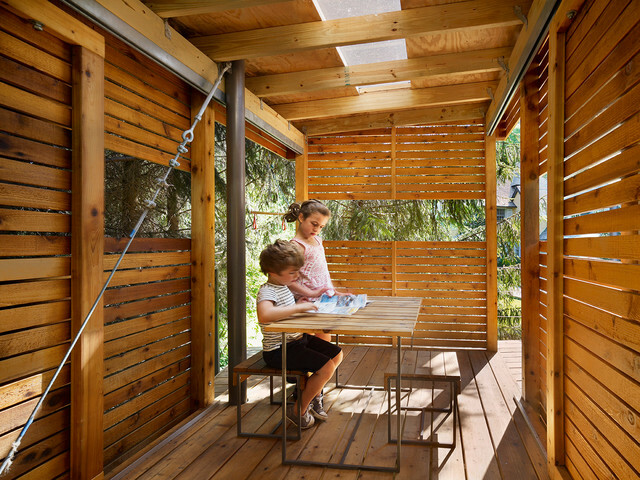 New York architecture firm Palmer Thompson-Moss created a 200-square-foot screened-in space complete with an ice chest, outlets for speakers, salvaged lighting, built-in benches and even a sandbox. OK, my fellow nerds, we are never going to top this one, no matter how hard we try! It's a fort for grown-ups ... grown-ups who love J.R.R. Tolkien. The owner is a serious collector of J.R.R. 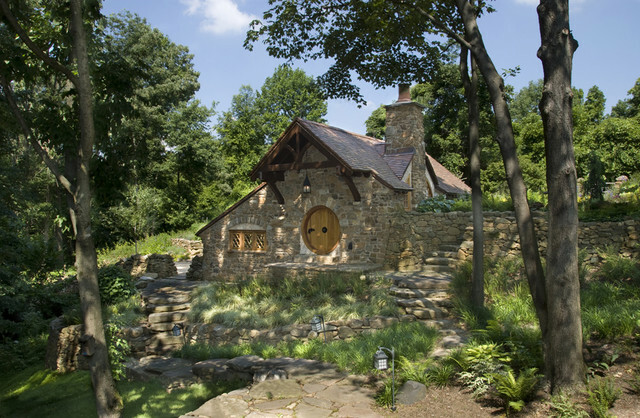 Tolkien books, manuscripts and artifacts, and The Hobbit House is the ultimate spot for storing and enjoying his collection.